Not only is the Toro 38381 18-Inch 15 Amp Electric 1800 Power Curve Snow Blower the most maneuverable electric snow blower on this list; this machine is one of the easiest-to-handle electric snow blowers among the best electric snow blowers currently available in the market. 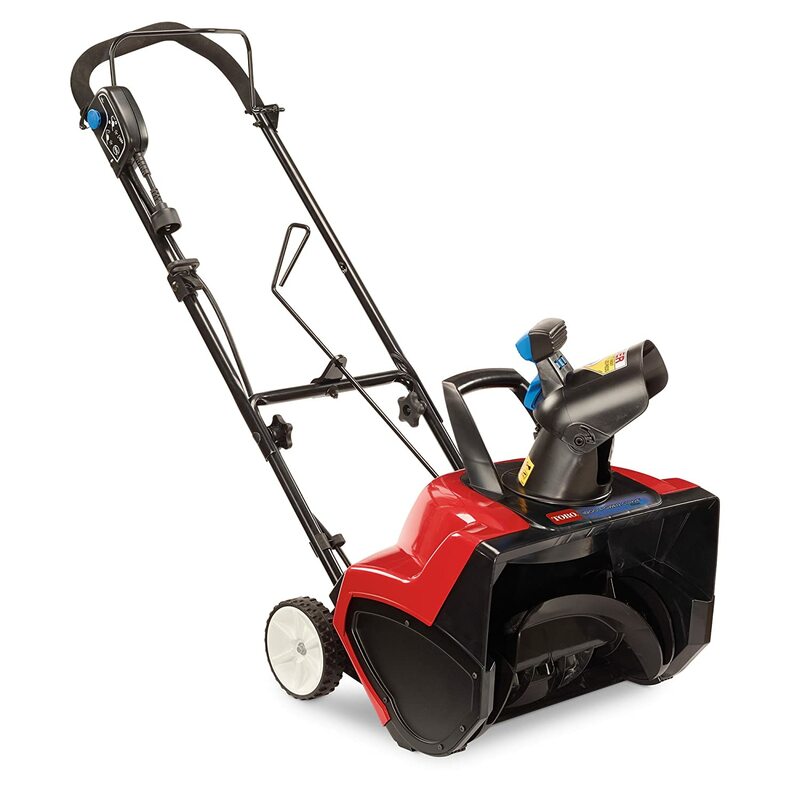 Coming in at just 24 lbs (34.4 lbs when shipped), as well as 36.2″ x 18″ x 47″ in dimensions, the aforementioned electric snow blower requires you to exert only little effort in moving it around. Couple the electric snow blower’s lightweight design with this machine’s ergonomic handle, directional-control handle, and large (6″) wheels, maneuvering the machine will be easy indeed. But this doesn’t mean the Toro 38381 Power Curve Snow Blower is a lightweight when it comes to power generation. This electric snow blower comes with a strong, series-wound 15 amp motor that enables the machine itself to clear away 700 lbs of snow per minute. The machine can also clear within 20 mins a 18″-wide area full of snow as deep as 12″. The rest of the useful features of the electric snow blower are: durable plastic body; easy start-up even on cold days; telescopic handle you can adjust up to 6 ins, which prevents you from having a backache even if you use the electric snow blower for a long period of time; curved rotor and inverted funnel housing, which not only enables the electric snow blower to move more snow in less time than the other similar snow blowers currently available in the market, but also prevents clogging; ‘Zip Deflector’ that allows you to easily change and the angle of the chute to point towards wherever you’d like; extension cord that can be locked in place, which saves you from the hassle of having to drag, carry, or lug it around; and need of neither spark plug changing nor tuning-up, which makes the electric snow blower produce less waste than gas snow blowers in general. Although the Toro 38381 Power Curve Snow Blower appears to be an effective machine indeed, some consumers have taken note of a few drawbacks to this electric snow blower. According to them: The electric snow blower isn’t as powerful as users would like; starting it up isn’t as easy as hoped; the handle is made of a metal that isn’t as durable as it should be; the small chute tends to clog up; and it’s a chore to carry the extension cord around when the electric snow blower is in use. Nevertheless, the electric snow blower has received a rating of 4.1 stars out of 5 on Amazon with shipping free of charge. If you want an electric snow blower with a bit more power than the other previously reviewed can generate, we suggest you check out the Snow Joe SJ620 18-Inch 13.5-Amp Electric Snow Thrower. Being a bit more powerful than the former may not seem much, but that 1.5 amp of extra kick significantly increases the latter’s effectiveness; easily making it more effective than several of the other best electric snow blowers currently available in the market. In fact, the aforementioned electric snow blower can move up to 650 lbs of snow to a maximum distance of 20 ft per minute; as well as cut through 18-in wide, 10-in deep snow in one pass. This is made possible by the electric snow blower’s 5 steel rotor blades. But having all these features doesn’t mean the Snow Joe SJ620 18-Inch 13.5-Amp Electric Snow Thrower is just a powerhouse. Like the electric snow blower previously reviewed, this electric snow blower comes with several features that make it easy and safe to use. These features are: ergonomic grips; 180-degree adjustable chute, which allows you to point it away from anyone or anything the snow might harm; and chute deflector, which prevents the snow from going too high up into the air and make a huge mess. The rest of the useful features of the electric snow blower are: ‘instant’ startup; safety switch; and compact wheels, which make maneuvering the electric snow blower around a cinch. 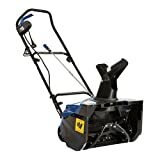 Like the electric snow blower previously reviewed, the Snow Joe SJ620 18-Inch 13.5-Amp Electric Snow Thrower can’t generate enough power for doing heavy-duty work, and comes with a cord that’s a hassle to carry around when this electric snow blower is being employed. Another complaint a few consumers aired online about the electric snow blower is how it tends to break down after only a brief period of use. The electric snow blower, however, has received a rating of 4 stars out of 5 on Amazon. If you want an electric snow blower that is designed to generate sufficient power while remaining easy to handle, the WORX WG650 18-Inch 13 Amp Electric Snow Thrower might very well be the electric snow blower for you. Being more or less as powerful as the two electric snow blowers previously reviewed, this electric snow blower helps you easily move away the white stuff from your property. To be precise, the electric snow blower can clear an area of snow 18 in wide and 9 in deep to a maximum distance of 30 ft. But, unlike both the electric snow blowers previously reviewed, the electric snow blower comes with a handlebar that can be adjusted to three different heights and that has ‘quick’ clamps that make assembly and adjustment hassle free, has mounted, oversized, 180-degree chute direction control, and is designed to be easily collapsible. As such, the electric snow blower is more versatile than several of the other best snow blowers currently available in the market. The rest of the useful features of the WORX WG650 18-Inch 13 Amp Electric Snow Thrower are design that makes storing this electric snow blower even in a small space hassle free, and rubber-tipped steel augers; which make moving away snow even easier using the electric snow blower. The auger shaft of a consumer’s WORX WG650 18-Inch 13 Amp Electric Snow Thrower broke when he used it for the first time. But generally consumers have no complaints about their models of this electric snow blower. Furthermore, the electric snow blower has received a rating of 4 stars out of 5 on Amazon with shipping free of charge. Since it’s obvious that we all should start taking better care for the environment than we used to do, each one of us should start coming up with ways to decrease our carbon footprint now. We believe that currently there’s no better way of lessening the pollution we’re generating than employing machines that generate as less pollutants as possible. Given these reviews of 3 of the best snow blowers currently available in the market, we hope you’ll be able to do your part when the Yuletide season comes around. i have brand new yardworks electric snow thrower. only one mint run and then stop .